Mark Supik, a Baltimore woodturner, and his woodturning students have challenged themselves to turning 100 bowls out of one fallen pine tree. The project began in March of 2010. 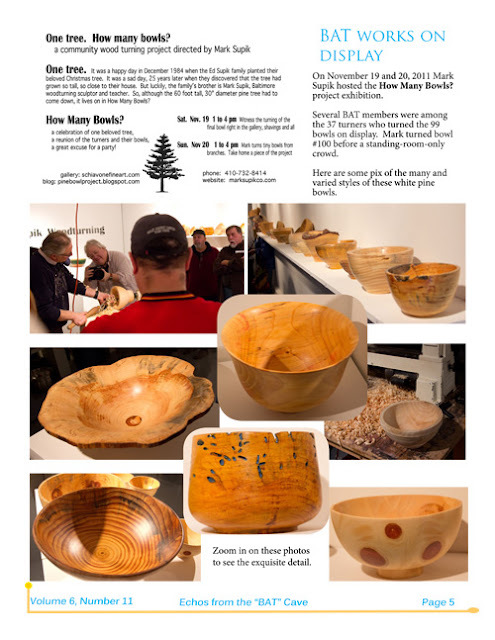 Follow the story of each bowl as it goes from log to finished bowl, or better still, come learn bowl turning and help us reach our 100 bowl goal! Thanks to the Baltimore Area Turners for this story in their December newsletter about the show. It was great to see so many club members at the gallery. Appreciate your support for the project. Check out Joe Nash's photo journal, Nahsification, for more photos and a video of the show. Thanks Joe! The Mark Supik & Co. sweatshirt never looked better! The How Many Bowls? show was a great party! Thanks to all of the turners who made it back with their bowls. Mark turned the 100th bowl in the gallery on Saturday to a cheering crowd. Special thanks to Kini Collins for her help in setting the show. And thanks to Dan & Liz Schiavone for their hospitality at Schiavone Fine Art. Here are the largest bowls drying after their final coat of finish. The largest has a 23" diameter. Hope we have enough pedestals. 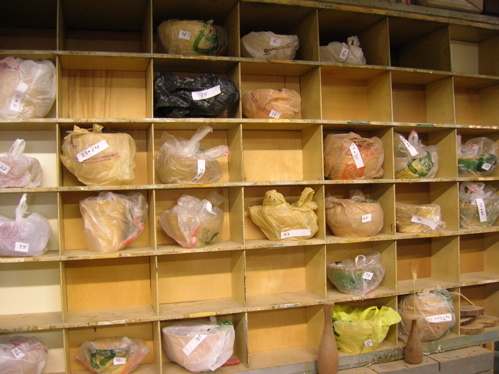 Thanks Melissa, Gretchen, John, Andrew, Chuck, Danielle, Mechelle, Leisha, Joe & Ed for getting your bowls to us this week. Hope you can all make it on Saturday or Sunday. Need more information about the show. Here's a link to the invitation. Our goal was to turn 100 bowls from one pine tree. You'll see if you make it to the show this weekend that some of the bowls didn't quite make it through to the finish. These are two of Mark's. Any other turners who haven't brought there bowls by because they aren't perfect, we don't care. It's all part of the process. These two will be on display at the show. We may even have pretzels in them! The How Many Bowls? show is from 1 - 4 pm on both Nov. 19 & 20th. Schiavone Fine Art at 244 S. Highlandand Ave is not far from the shop. The gallery is an old Moose Lodge that's been restored by it's owners, Dan & Liz Schiavone. It's worth the trip over just to see the beautiful restoration. Plenty of great restaurants nearby if you're making a day of it. On Saturday you can walk to DiPasquale's (open for lunch, closes at 6 pm) and to The Laughing Pint (opens at 3 pm, open late) from the gallery. We may head there after the show ourselves. Still have a few spots left on the shelves. If you haven't gotten your bowl to us, it's not too late. We're into the final countdown.